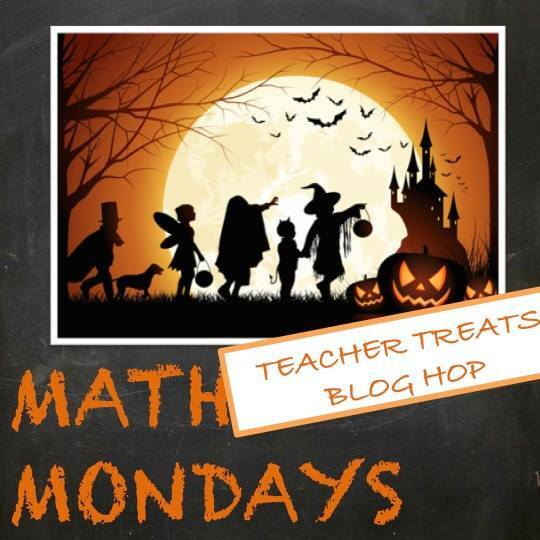 I am very excited to participate in Education with DocRunning’s Teacher Treats Blog Hop. I am currently teaching slope and rate of change to my eighth grade students, so I’d love to share some strategies and activities that my students and I love. It’s true. I have lived in New Hampshire all my life and I can’t ski. I went on one ski trip as an eighth grader and all was going well until my friend convinced me to take on a very, very difficult trail. Let’s just say I knew that as the ski lift climbed higher and higher up the mountain that I would not be skiing down. Long story short, I held down the bar when we got to the top and convinced the employees to let us ride back down on the lift. I love sharing this story with my eighth graders and I spare no detail. Every year I have all eyes locked on me, total engagement, as I tell them about my personal experience. The UNDEniably terrifying mountain that appeared to have UNDEfined slope. When possible, I love to use personal anecdotes with my students. I think it’s a great way to build relationships with students, and, in the very least, it wakes them right up! 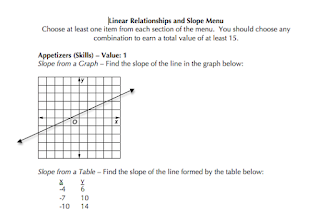 2 – Soccer in Math? My students in standard level eighth grade math struggle to understand the difference between zero and undefined slope. I couple of years ago I drew some symbols on the front whiteboard and said aloud, “Imagine the 0 is a ball that someone is standing on.” Somehow that simple statement has evolved into a demonstration of me standing on a soccer ball in front of my students. (You might even find a vine somewhere floating around if you search crazy math teacher on soccer ball.) The connection is that if I hold the ball over my head there is ZERO excitement. If I stand on top of the ball I will UNDoubtably fall over (hopefully without injury). As silly as this demonstration is, I believe it gives them a visual to associate with an otherwise abstract concept. 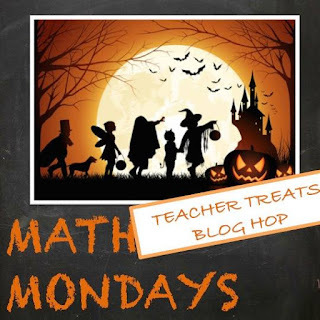 Another strategy that helps reinforce this topic is using the multiplication check. I start by reminding students that we know 12/3=4 and 4*3=12. So 0/3=0 because 0*3=0 (check in reverse). However, 3/0 cannot equal 0 because 0*0 does not equal 3. The answer must be undefined. My eighth graders love to write on my whiteboard. Consider ditching the worksheet and inviting students to write on the front board. I use this practice method for many different skills. I invite 5 volunteers to front board. Students at their desk each have a piece of paper that they are writing on. 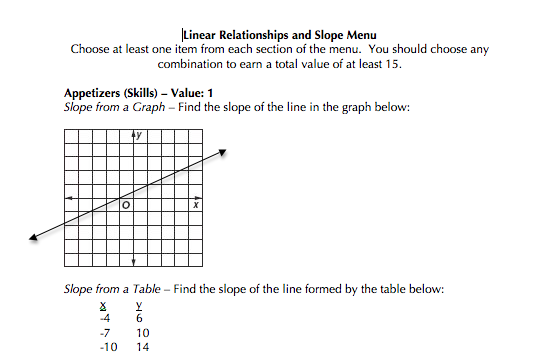 For slope, I would read aloud two points and ask everyone to find the slope of the line that passes through the two points. Students at their desks try the problem on their paper, while I can monitor the progress of students at the front board. Everyone tries the same problem at the same time. After everyone finishes the problem, we discuss anything tricky or interesting and then rotate to have five new volunteers come to board. Some classes are more willing and eager to come to the board than others. I refer to students who need some coaxing as “non-volunteers,” and require that all students come up to board at least once. I try to be strategic when selecting groups of students so that I can differentiate based on readiness and help all students build confidence. Slope has great connections to the world around us, and it tends to bring out my creative side. 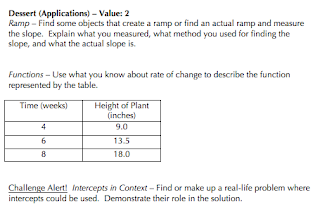 I would love for you to comment below with activities and strategies that you love to use when teaching slope and rate of change in your classroom. Thanks for stopping by!